The Marías made their way to the Observatory OC in Santa Ana, California on February 14. With a full tour schedule ahead of them, this stop was only the beginning of a busy year for the band. Known for their unique psychedelic pop-soul sound, The Marías have carved their presence into the indie, soul, and psychedelic scene. Though they are based (and rising) in Los Angeles, the band is extending their outreach far past the city of never ending traffic. With their earlier release of the album Superclean Vol. I in November of 2017 — which was soon followed by its sequel Superclean Vol. II released in September of 2018 — the Marías have already established themselves as artists who extend far past a singular genre. In fact, the groups music is an exciting blend of a unique and varied assortment of sounds, feelings, universes, and languages. The spirit of Valentine’s Day seems to hang in the air of the Observatory. Fans are airdropping each other photos of puppies and waiting excitedly both in and outside of the venue. Staff members are even handing out small Valentine Grams that the band had made as fans make their way through security — an absolutely adorable detail that only adds to the experience of the night. There are two opening acts set to grace the stage before The Marías themselves. First up: Vanessa Zamora. The indie pop slash alternative singer plays music inspired by her upbringing in Tijuana, Mexico. A truly eccentric performer, she is constantly buzzing around the stage, even getting audience members to hit a cowbell to the beat of one of her last songs. A majority of her music is sung in Spanish, reminding the audience of the dip into the roots that the Marías make sure to include in their own music. Off to a great start, we wait for the next act. Up next: Dreamer Boy. Dreamer Boy is a small but mighty indie-alternative group made up of members Zach Taylor, Bobby Knepper, and Savannah Dohler. Based in Nashville, Tennessee, they bring the sweet country boy feel straight to Cali. Taylor would frequently call out “Can I get a yee haw?” in between songs, always met with an enthusiastic “yee haw!” in reply. Tatlor sang songs from their newly released album “Love, Nostalgia.” Though they are relatively green, Dreamer Boy has a great stage presence and performance quality that is a perfect lead into the headliners of the night. Both opening acts seem to represent a different aspect of the Marías own music. Zamora brought the the bands blend of culture, while Dreamer Boy reflected the modernized breakthrough indie sounds many of their songs have. Audience members are still in high spirits, and that sprinkling of love still wafts in the air of the night. Before the band walks out, two young woman walk to the side of the stage. There lies an entire dinner scene, complete with candles and a waiter that brings (real) different courses out throughout the show. As the woman begin a conversation and sit down, the lights go up and The Marías enter the stage. The Marías are made up of band members Josh Conway on drums, Jesse Perlman on guitar, Carter Lee on bass, Edward James on keys, and of course Maria on vocals. One thing about this show that makes it so enjoyable has to be its attention to detail. 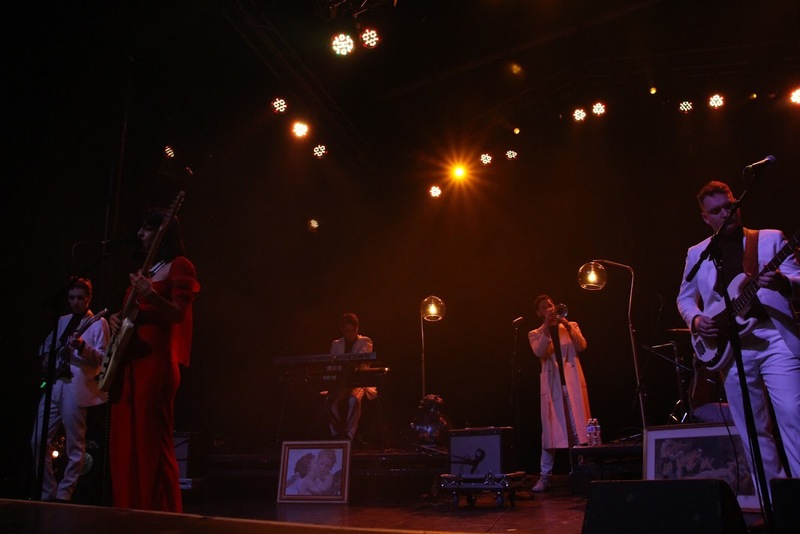 Every audience member gets a Valentine Gram, an entire dinner date occurs as the Marías perform, even the decor of the stage itself adds to the ambiance that exemplifies the concerts experience. It is hard to find a description that fully encapsulates the feelings that the Marías music brings. Dreamlike, transcending time, and enchanting all barely begin to scratch the surface, however they are likely the closest one could get in terms of wordly explanations.